In one of our previous blogs, we’ve talked about how weather circumstances can affect the functionality and use of certain fall protection systems. As you can imagine, the fall protection system isn’t the only thing that is influenced by the weather. 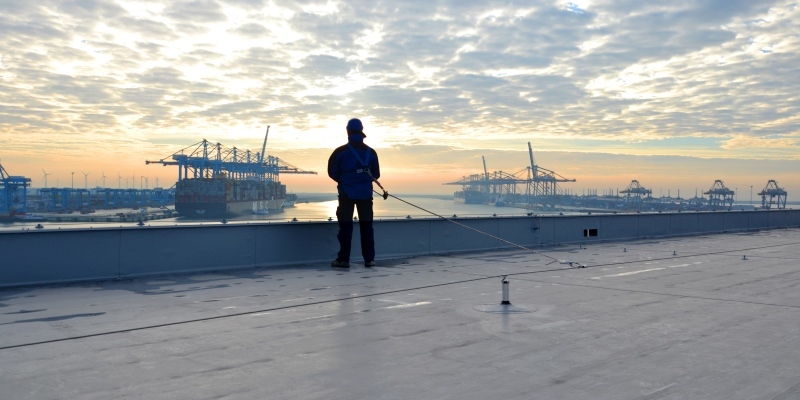 For this blog, we will take the standard conditions of the four seasons (winter, spring, summer and fall), discuss how the weather can influence the user of a fall protection system and how to prevent the potential effects. As noted in the previous article, periodic seasons and the corresponding weather conditions can differ all over the world. First let us sum up some of the main characteristics of the weather that are paired with a certain season. Winter is often associated with freezing temperatures. Especially at night, temperatures can drop rapidly and can affect the working site for the next day. For example, descended fog or superficial water can freeze and turn a (roof) surface into an ice skating platform. Therefore, it is of big importance to move carefully and watch your footwork while entering a surface that has been exposed to these conditions. Once you have visual contact with your intended job site, you can see if it is safe enough to proceed and most important: how to get attached to the nearest fall protection anchor. A slippery surface isn’t the only hazard during winter. Cold itself can have various effects on the human body. Cold is a subjective perception, not everybody has the same perception of what is cold or not. When dealing with low temperatures for a longer period of time, without being properly dressed, it can cause your muscles and nerves to cool down, leading to the loss of coordination and strength in your limbs. Something you never want to experience when working at height. When you notice that your body starts to react to the effects of cold or freezing weather, you are too late. Clothing: match your clothes to the type of cold you are facing. Whether you wear specialized equipment for extreme environments or just multiple layers of regular clothing to face the superficial cold. Eat well: the best way to generate heat in a cold climate is to eat well. This fuels your body with energy, generating heat from within. Start the day with a good healthy breakfast before going out to work. Go inside: even when properly prepared and dressed, take a break every now and then to go inside. Warm yourself with a hot drink and take the time to rest before heading back out. Wherever your location is, summer is often seen as the warmest three months of the year. Next to the circumstances that warm temperatures bring, it also increases the risk of (tropical) storms and hurricanes. Both are things you have to take into account before going out to work at height. In many ways, with heat you’ll have to have the same approach as with cold. Be prepared for what you are dealing with and understand the risks/dangers you are facing. High temperatures can affect various objects in your surrounding or on your job site. For example, being exposed to sunlight for a longer period of time can “melt” roofing materials, weakening roof structures and causing workers to slip, trip or fall. In more and more countries, roofers plead for the use of brighter type roofing materials, such as white. It is proven that white roofing materials do not only lower the costs in maintenance of the roof itself, but that it also has a cooling effect to the space below it, because as opposite to black, brighter materials absorb less heat. The fact that it’s hot is not necessarily an indication that it is dangerous to work outside. The most important factor to take into account is the sun. One of the main risks when working in an open or unprotected area is that someone can get a heat stroke, also called heat illness. A heat stroke can have various effects on a person before really kicking in. Often starting with red or dry skin, followed by a headache and dizziness. All types of symptoms which aren’t welcome when balancing on a steel beam at 50+ meters (160+ feet) above ground. Besides a heat stroke, these weather conditions can have several other effects to the concentration and personal health of a worker, such as sun burn or dehydration. Gear: select the right gear based on the conditions you are facing. Wear head gear to protect your head from the heat and protective (sun) glasses to prevent the risk of being temporary blinded, possibly causing a fall. Drink enough: the human body runs on fluids. Being properly hydrated is the most important factor to withstand the power of the sun. Make sure you take brakes regularly to drink, preferably water. Never drink alcohol while working at height! Skin protection: a heat stroke starts with a sun burn. Your skin has been exposed to sunlight for a longer period and has absorbed too much heat causing a burning feeling and a (red) look. Be sure to use proper skin protection on all exposed limbs before heading out or wear long pants and/or a shirt with long sleeves. Go inside: even when properly prepared, take a break from your work every now and then and go inside or look for a shady spot. Have a (cold) drink and take the time to rest before heading back out in the sun. With bearable temperatures and mild conditions, this season is considered to be the most ideal period of time to perform outdoor work. When we talk about the circumstances of the fall period and the effects it has on workers, we like to focus more on surrounding and the job site. As well known, the fall or autumn is partly characterized by the shedding of leaves from deciduous trees. This can cause a very hazardous situation when you think of working at height. Especially during periods where rain prevails, fallen leaves become extremely slippery. For buildings or structures in environments with a large amount of trees, it may require that the roofs of these buildings need to be cleaned more often. This means that they need to be accessed by maintenance personnel. Wet and slippery surfaces require workers to be very careful in what they do and where they step. When accessing a roof (or other height) in this situation, the use of a fall arrest or fall restraint solution is required. When large proportions of leaves cover a work area, always be sure to watch your step. Fall protection systems can be covered by leaves and cause additional trip hazards. Clothing: match your clothes to the type of weather you are facing. In case of rain make sure to wear protective clothing that prevents you from getting wet, like a rain jacket. Wet clothing can cause your body temperature to drop with its additional consequences. Working in wet clothing for a longer period of time also increases the risk of catching a cold or getting sick. Clear the way: when accessing the work area, make sure a proper walkway is cleared of leaves or clear the way with a broom as you proceed. A fall from height due to tripping or slipping on wet leaves isn’t the only risk. An unexpected slip or trip can also cause a person to fall on the level where he or she stands. In combination with an awkward landing this can also cause serious injury. Dry your equipment: if your equipment (for example fall protection PPE) got wet due to rain during work, let it dry on its own before using it again. Never use any form of electronic or gas powered heathers to dry fall protection PPE! This can cause material to melt and will make the equipment decrease in strength. After your PPE has dried, perform a pre-use check and if it passes you can continue operation using this equipment. Always be sure to check the weather forecasts and/or outside temperature during preparation for outdoor work. Not sure how to act in certain weather conditions or do you want to have a physical reminder for your personnel? Download one of our FREE posters and make sure that workers know how to deal with the circumstances that they face.